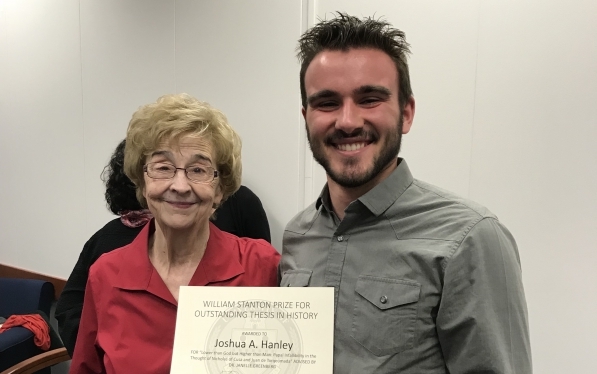 Graduating senior Joshua Hanley has been selected by the History Department as the recipient of the William Stanton Prize for outstanding honors thesis in History written in the 2017-18 academic year. The Stanton Prize has been generously established by Pitt alumnus Mr. David Frederick, in honor of his mentor William Ragan Stanton, an esteemed American historian who taught in Pitt’s History department from 1962 until 1994. Hanley's thesis, “Lower than God but Higher than Man: Papal Infallibility in the Thought of Nicholas of Cusa and Juan de Torqeumada” was advised by Professor Janelle Greenberg.